7 years ago, the original S.H. Figuarts Amazon was released, we reviewed it in 2016. Looking back now, that Amazon is an extremely dated figure. Even though for it’s time it was a fantastic addition to any collection, today Bandai spoils us with so much more. Just released this month is the long awaited modern update for Amazon, S.H. Figuarts Shinkocchou Seihou Kamen Rider Amazon! The Shinkocchou Seihou subline has thus far been excellent, there’s no way to diminish how truly wonderful it’s been. But Amazon really ratchets things up. This is by far my favorite release in the line thus far, and one that really goes the distance to recreating the suit and character to near perfect detail. An excellent looking figure at the very least, Amazon also has a wealth of articulation that the original figuart lacked. While it may lack something in the accessories department, there’s no doubt that this is the definitive figure of Kamen Rider Amazon! You can enjoy 70+ images of Shinkocchou Seihou Amazon after the jump by clicking “Discuss on the TokuNation Forums” at the bottom of this post. Coming up soon, a fresh batch of galleries from Ex-Aid, Build, Amazons, and W! It was only a matter of time before these Amazons made their debut. After the critical & commercial success of the Amazon Prime series Kamen Rider Amazons it was a no-brainer to see the (so far) only new riders/forms from season 2 get the figure treatment. S.H. Figuarts Kamen Rider Amazon Neo is currently set for release in October 2017 at a price point of 5940 yen. The lone scan available does not currently suggest this is a webshop item so he may very well be a normal retail release as Amazon Alpha & Omega were previously. 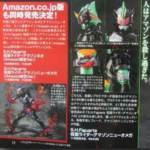 However there IS an advertised Amazon Neo Amazon JP Edition, much like the previous riders. This version will not come with color coded flames, but seeming re-releases of standard red tamashii flame effects. This version will also be released in October at the higher price point of 7020 yen. S.H. Figuarts Kamen Rider Amazon New Omega likewise seems to be a retail release, just in November, similarly priced at 5940 yen. And just as with Neo, New Omega will also get the Amazon JP Edition treatment, assumably with yet more flame effects. This version will be release in November as well for 7020 yen. Perhaps the most twisted of the three Amazon riders finally arrives to join your S.H. Figuarts collection! Arriving this July is S.H. Figuarts Kamen Rider Amazon Sigma! Amazon Sigma had been revealed previously at Tamashii Nations 2016, but this set of official images gives us our best look at the figure yet. Unlike the previous two Amazons releases (Alpha & Omega), Sigma actually includes a recolored Tamashii Flame Effect set already. Rather than it being a pack in for the Amazon.JP edition as with the other two. However Sigma is also a Tamashii Web Exclusive which may be a bummer to some collectors. S.H. Figuarts Kamen Rider Amazon Sigma will be release in July 2017 for 6696 yen. Be sure to get in touch with your favorite middleman or web exclusive service soon to secure an order for one! The finale of Toku Toy Box is here! For our final gallery this year we’ve decided to mix things up a bit. In honor of the recently released figuarts of Alpha & Omega from the Kamen Rider Amazons mini-series, we’re sharing a gallery of their Showa Predecessor. S.H. Figuarts Kamen Rider Amazon (Amazon JP Edition)! The original Kamen Rider Amazon was the definition of a violent berserker, so it’s no wonder his Heisei counterparts share that aspect of his nature. This release of Amazon was exclusive to Amazon Japan years ago, just as there are now Amazon JP editions for Alpha & Omega. The primary difference being the boxes, and in Showa Amazons’ a special personalized Tamashii Stage Label. But don’t be folled by this figures age, S.H. FIguarts Kamen Rider Amazon is still an excellent addition to any rider collection. Enjoy over 60 images of this figure by clicking “Discuss on the TokuNation Forums” at the bottom of this post. As always we have a full review written up as well! 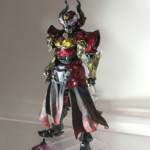 This has been the final Toku Toy Box gallery for this years giveaway. The winners will be selected at random on January 4th!